It’s been a roller coaster and wonderful ride with Kev, who’s been a star of The Grounds for over 5 years now and we’d like to honour the big guy with 7 Weeks of Kevin – A celebration of all he’s given to The Grounds and his retirement to greener pastures. From being pig-napped in 2013 to gracing us with his daily walks and Sydney Park mud-rolling since… well since we could trust him to not run away, it’s been a real treat having him with us. Let’s back-track. That’s right, pig-napped! What a drama. Kev’s abduction went national AND went viral, many thinking it was such a ridiculous occurrence that we’d staged the whole fiasco. We placed a reward for his return, and two weeks later the big guy found himself at a Victorian veterinary clinic, sick-as-a-hog after being bitten by a snake and almost leaving us for good. But, with the classic Kevin Bacon resolve, he knew he had more to give and returned to The Grounds in a blaze of glory. At the end of the 7 week celebration, Kev will take up a new residence with the friendly folks at The Riverside Farm Escape (where he’s got a big family of kids awaiting his arrival) and we’ll welcome the newest addition to The Grounds family, a young prince in the waiting, ready to take on the Kevin Bacon throne and join his new home. We’d love for you to celebrate with us so stay tuned for all the exciting plans in store over the next 7 weeks. Check out everything on around The Grounds for winter, including events and workshops. 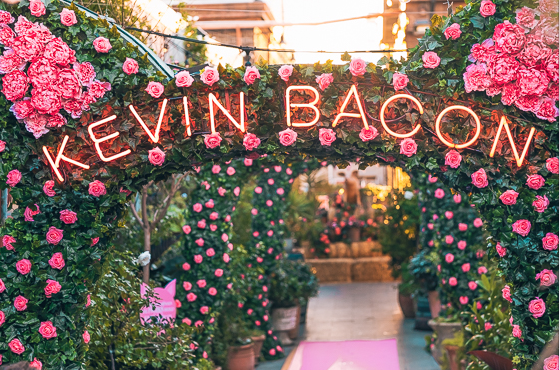 We’ve had a hoofing good time celebrating our beloved Kevin Bacon during his retirement celebrations at The Grounds, but unfortunately as they say, all good things must come to an end. It’s with a very heavy heart that we prepare to farewell Kev as he heads up to The Riverside Farm Escape. So… how do you honour someone in the best possible way? We’re sending him out in style and would love for you to join us for the celebrations and wish him a big warm farewell! Round up the gang and kick the morning off with brunch in The Potting Shed. Enjoy a two-course breakfast menu with main meal of your choice, accompanied by fresh juice and The Grounds Roastery coffee. Mimosa’s available from 10am! Book here. 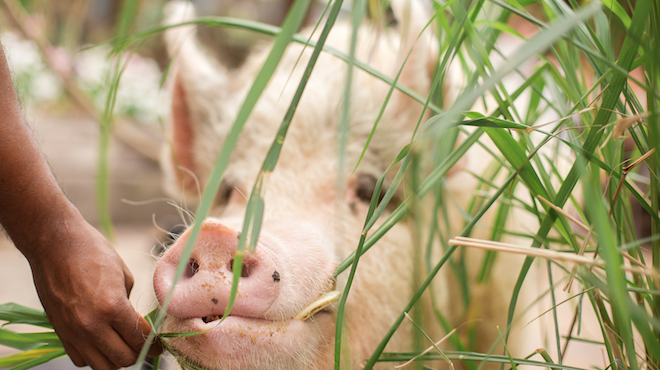 Dress up as your favourite farm animal for a chance to win prizes from our farm friends at Pass the Pigs. Competition will be judged with winners announced in The Garden near the fountain at 10am and 2pm. The Cafe 7:30am-4pm. 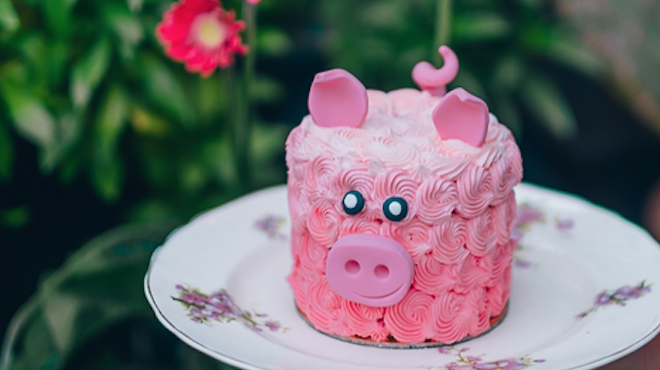 Check out Kev’s Pig-Out Cake and the Piggy Piggy Shake! 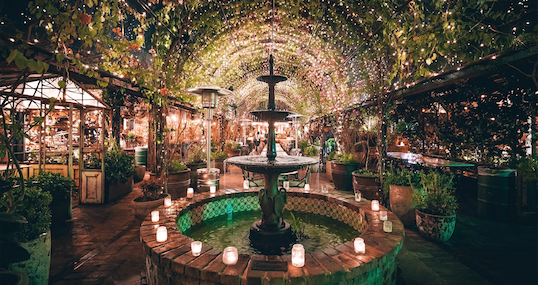 The Potting Shed: 11am -10pm (Sat) and 11am-9pm (Sun) – Say cheers to the big guy with our Pig Tail Cocktail! Our Local Made Markets will be running all weekend in The Market Space. Join us for a showcase of talented local makers and designers from across Sydney. Be sure to drop by and visit Kev in his final week at The Grounds! We’ll be celebrating his final day at The Grounds on Sunday August 19th before he jets off to The Riverside Farm Escape – stay tuned for all the details of the celebration! Join us for a special brunch in The Potting Shed on Sunday 19th August, and enjoy a 2 course brekkie menu before you farewell the big guy. Reservations available here. 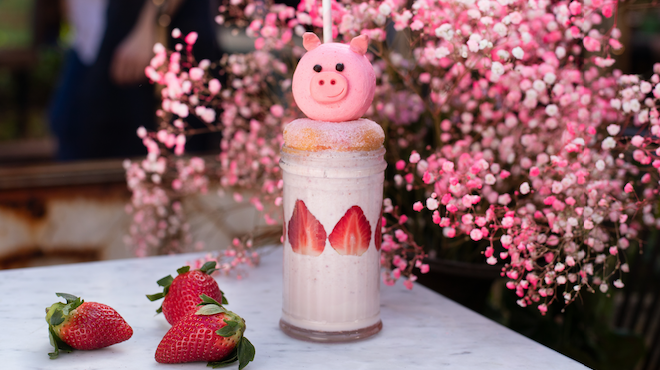 Kev’s really making a mark on The Cafe, with a new dine-in strawberry milkshake offering. Topped with a fresh donut and piggy meringue, we think it’s almost as cute as Kev! Available in The Cafe, from 7am-4pm daily & 7:30am-4pm on weekends. 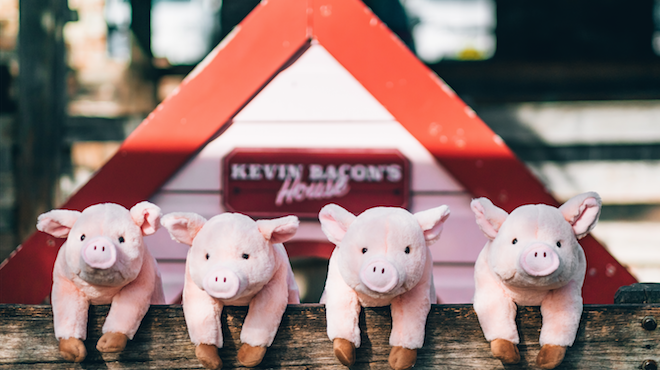 If you’ve always wanted a Kev of your own but pig-napping isn’t your thing, these little softies are for you. Our new, soft plush toys make for the perfect snuggle buddy, for the young and young at heart. You can pick one of these furry friends up from The Cafe, or the cart in our laneway. What a better way to enjoy the winter and to celebrate Kev’s retirement…. Introducing the ‘Hot Trotlate’. 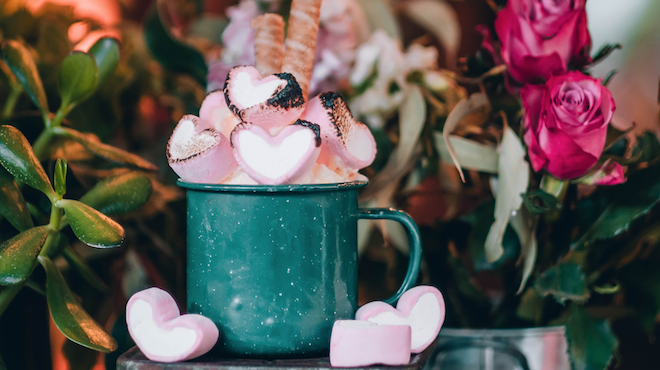 Smooth hot chocolate topped with fresh whipped cream, toasted heart shaped marshmallows and chocolate wafer straws. Available in The Garden Bar for the next 4 weeks! 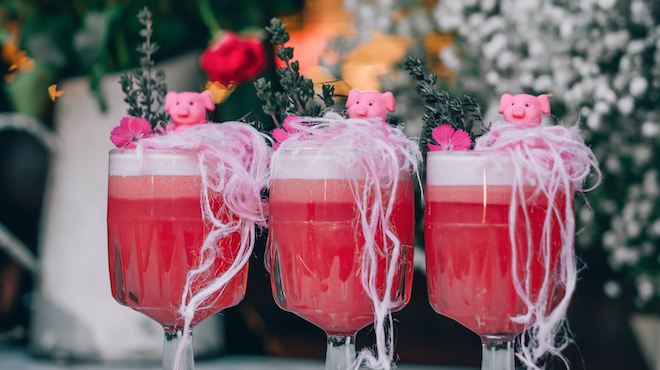 Nearly everyone has a tale to tell about the big guy…so, we created ‘The Pig Tail’, a special cocktail available in The Potting Shed for 6 weeks! A delicious mix of gin, fresh strawberries, lemon juice, raspberries and more – it’s the perfect way to say cheers to Kev! This limited edition cake is in celebration of our favourite farm friend and man of the moment, Kevin Bacon. Made up of vanilla sponge cake layers with strawberry confit & cream cheese filling, piped with ombré buttercream frosting and garnished with hand made fondant pieces. Order one to share (or to have all to yourself) online, or join us in The Cafe! To kick off the celebrations, Kev insisted we devote our laneway to him and we thought ‘who are we to say no to that?’. Take a wonder through, snap a pic or two and share in the celebrations for 7 weeks of Kevin! Location: The Grounds of Alexandria laneway (located between The Potting Shed and The Garden). You might have a few questions on what lies ahead for Kev, so here’s a little FAQ guide for you. If you want to shoot us an email with any other questions, please send them through to us at sayhello@thegrounds.com.au. It’s time for Kevin to retire! He’s been with us since day dot and will always be a part of our Grounds family, but it’s time he retired to greener pastures to enjoy life away from the big-smoke. Kev’s going to be taking up residence at The Riverside Farm Escape – and he’s got a whole bunch of kids awaiting his grand arrival. The folks at the farm are pretty excited to welcome him into his new home. Will we be able to visit Kev? Definitely! The Riverside Farm Escape is just over 3 hours north of Sydney in Minimbah, and you can definitely make day trips up (they even host camping sites too if you want to make a whole weekend of it!) They have a new website coming soon so we’ll link it here when it’s live and you can grab all the deets on going to visit Kev. They’d love to have you come past and see Kev. When is Kev’s last day at The Grounds? We’ll be celebrating Kev for a full 7 weeks with something new and exciting each week, and we’ll be bidding him farewell during August. Stay tuned for details on his final farewell.